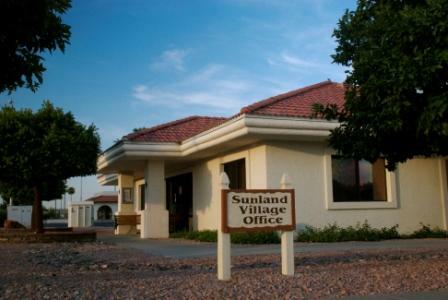 Sunland Village is located in east Mesa, Arizona. The Main Entrance to our community is on Diamond Ave. just east of Greenfield Rd. between Broadway Rd. and Southern Ave. If coming from Hwy 60 take the Greenfield Rd. exit and head north to the Diamond Ave. light. Head east into the community. The H.O.A. office is located at 4601 E. Dolphin Ave. Click here for a map of the community. Click Here to see a map of the main campus adjecent to the Sunland Village Office.